Zobrazit košík “Ipevo VX-1, konferenční telefon” bylo přidáno do košíku. 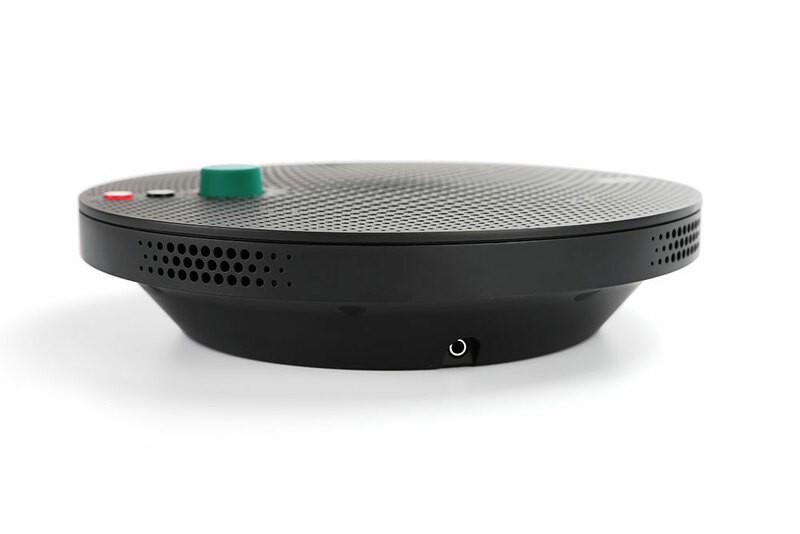 Ipevo VX-1 je špičkový univerzální konferenční hlasitý telefon. Pracuje se všemi komunikačními programy. Připojit lze pomocí USB rozhraní k počítači (PC/Mac) nebo pomocí 3.5 mm konektoru k telefonům a tabletům Apple/Android. Český popis zboží pro vás právě připravujeme. Nástupce konferenčního telefonu Ipevo XING (X1-N6 Internet Conference Station), který se již nevyrábí. The speaker’s not loud enough. Laptop and tablet speakers are design for personal use, and so they’re often not loud enough for a room full of people, even at maximum volume. The mic’s only designed for one person. 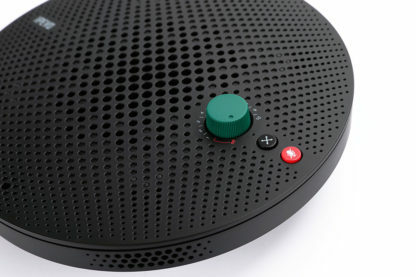 Built-in microphones can only capture the closest person’s voice clearly. As a consequence, everyone in the meeting feels they need to yell and/or crowd around the microphone, rather than sitting comfortably. Echo noise. 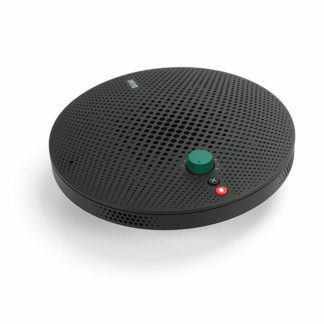 Very frequently, the person on the other end of the teleconference hears their own voice because their voice is played and then recorded into the mic again. This can really put a strain on comprehensibility during a meeting, leading to people needing to repeat what they just said. Plus, it’s extremely annoying! These issues interrupt, slow, and add frustration to remote meetings. 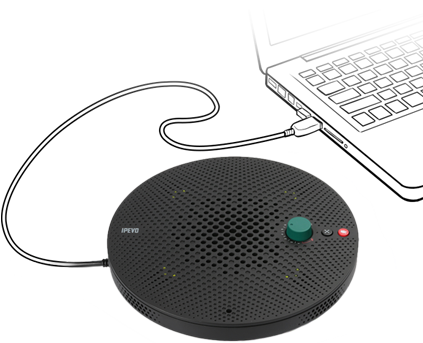 But all of these issues can be overcome with the IPEVO VX-1 Internet Conference Station, the perfect complement to your VoIP usage. With VX-1’s superior voice capture and transmission, everyone can hear, and everyone can be heard. VX-1 utilizes outstanding noise reduction and echo cancellation technology, thanks to a special 16-bit Digital Signal Processor (DSP) with built-in hardware acceleration. This DSP features 16 kHz sampling rate signal processing for exceptional echo cancellation and adaptive noise suppression. The result is crystal-clear voice transmission on both ends of the conversation. One standard side effect of DSP is that it distorts voices, making transmitted voices too flat, too high, or otherwise different-sounding than the speaker’s natural voice. This is a common flaw in many conference stations on the market. To compensate for this DSP effect, VX-1 features another specialized sound processor that enhances, clarifies, and smoothes voices. 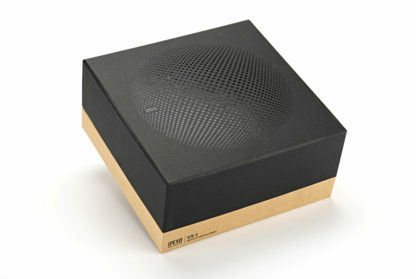 This includes rich reproduction of both low frequencies and high frequencies across a wide dynamic range. So whether low pitch, high pitch, male or female, all voices are optimized and clearly intelligible. The days of straining to hear (or making guesses) about what the other person is saying are over. Additionally, VX-1 is a full duplex system, meaning that both sides can communicate at the same time — just as if you were in the same room. This is in contrast to half-duplex, where only one side can speak at a time. VX-1 features a total of 5 built-in microphones to address any configuration of people around the device. The default microphone is the Omni Mic which receives sound evenly in a 360-degree range, making it ideal for capturing the voices of all participants positioned anywhere around VX-1. The difference you’ll perceive between the Omni Mic and your computer’s built-in microphone will be dramatic. The Omni Mic has a an optimal pick-up range of 6.5 feet. 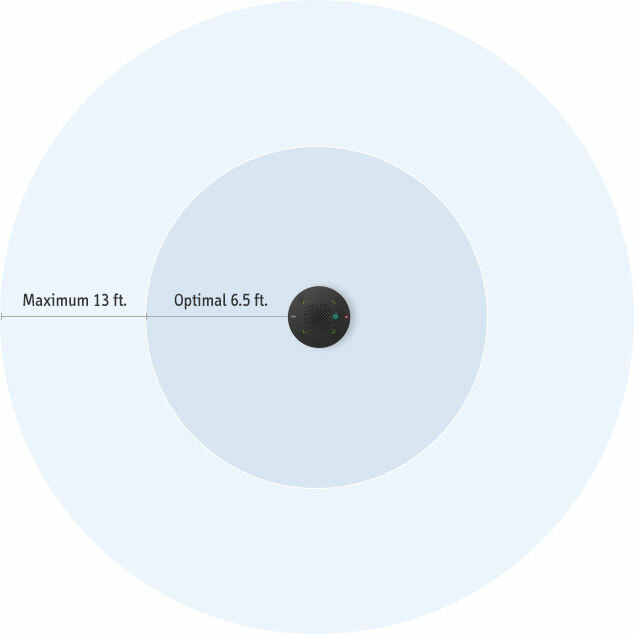 The maximum pick-up range is 13 feet. 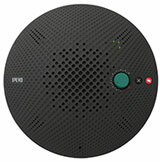 VX-1 also features a Zone Enhanced Mode that uses directional microphones. 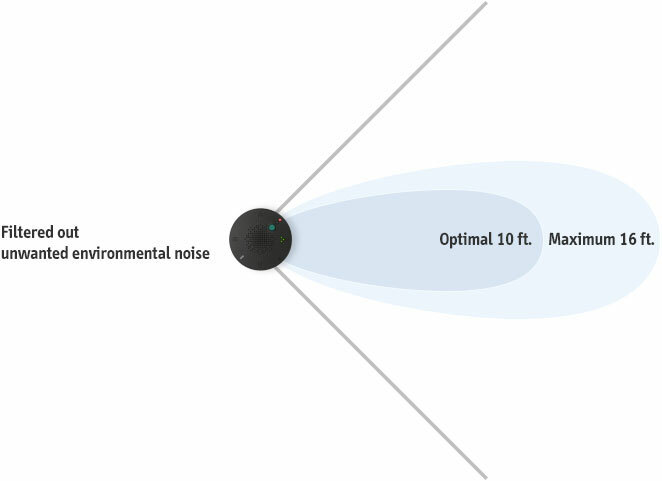 This mode is designed for maximum reduction of unwanted environmental noise. In Zone Enhanced Mode, one of four unidirectional mics (Uni Mics) is active. Mics are easily selectable with the Zone Enhancement button. Uni Mics have a longer range and higher sensitivity than the Omni Mic, and they primarily receive sound coming from one direction. In fact, they’re specifically tuned to exclude sound coming from other directions. Each Unidirectional Mic has an optimal pick-up range of 10 feet. The maximum pick-up range is 16 feet. With its elegant and modern circular shape, VX-1 is an eye-catching addition to the office that can be placed anywhere on the desk or table. It looks and behaves like people expect it to, so there’s never any confusion for guests using the station. And with VX-1, you don’t need to return to the computer or hunt around in the VoIP application to change basic audio settings. The station features three frequently-used buttons as well as easy to understand status LEDs. Power Switch & Volume Knob. These are radio-like knobs for intuitive volume adjustment. Volume adjustment should always be right at your fingertips. Zone Enhancement. Switch directly from Default Mode (Omni Mic) to Enhanced Mode (Uni Mic). Hit this button multiple times to switch between the Uni Mics. LEDs on top of VX-1 clearly indicate which Uni Mic is currently active. Mute. 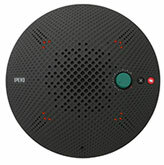 Mute VX-1 on the fly whenever conversation on your side needs to be kept confidential. Red LEDs will let you know when you’re muted so there’s no doubt. Omni Mic is on (Default Mode). One Uni Mic is active. 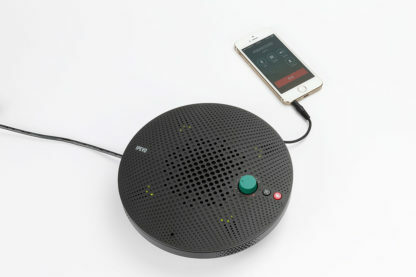 iDevices feature countless ways to communicate remotely, including free voice chat apps as well as good old-fashioned number dialing on iPhone. Whenever your group has a remote meeting, don’t crowd around the iPad or awkwardly pass the iPhone around. Simply connect your iDevice to VX-1 via the included 3.5mm audio cable. Plug the cable into your iDevice’s audio jack and you have an instant, professional-level conference station. With VX-1, there’s no need to hassle with installing drivers or extra software. 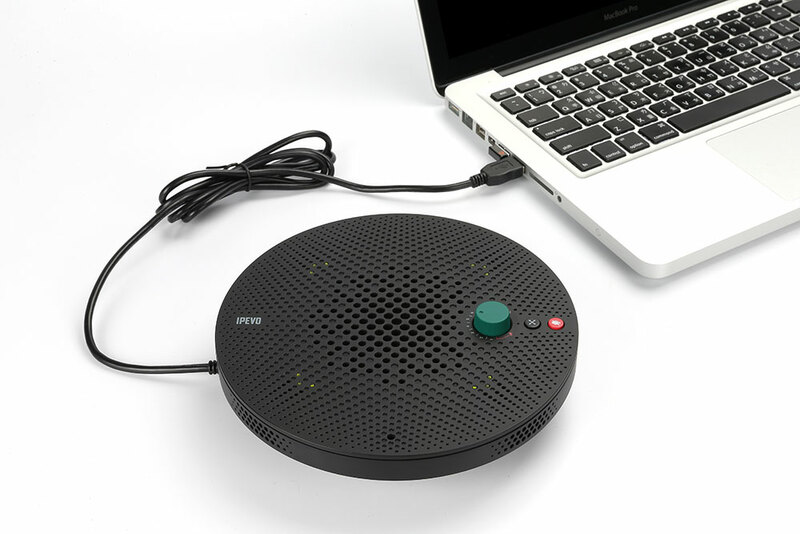 Simply plug VX-1 into your PC, Mac or iDevice (iPhone, iPad, or iPod Touch) and launch your preferred conferencing software. Or, if using the iPhone, just place a call like you usually do. 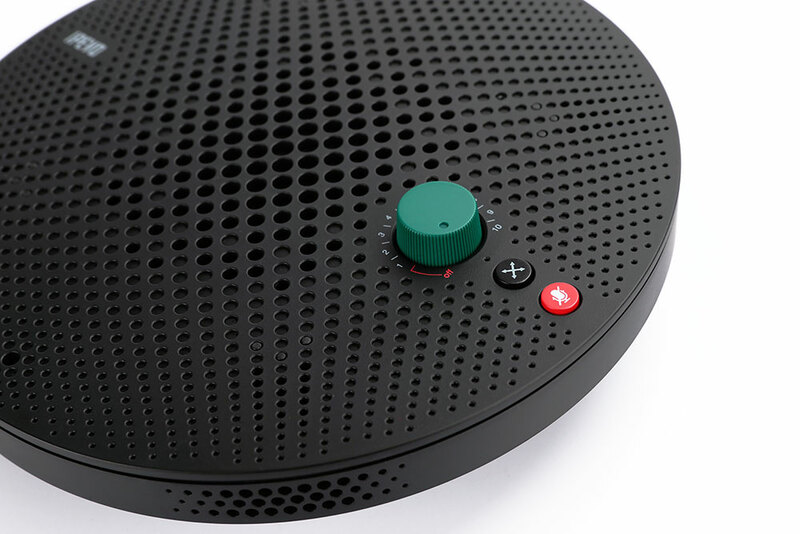 VX-1 automatically becomes your default speaker and microphone. VX-1 is compatible with a wide variety of chat and conference applications llike Adobe connect, GoToMeeting, WebEx, Google Hangouts, Join Me, Skype, TeamViewer, Facetime and many more. 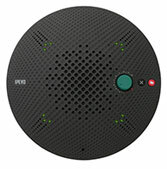 No matter what VoIP service you use, chances are the VX-1 can deliver immediate results for your next remote meeting. Napájecí USB adaptér není součásti balení. Je nutný pouze při připojeném telefonu/tabletu přes 3.5 mm konektor. K napájení Ipevo VX-1 použijte počítač nebo jakýkoli USB zdroj, alespoň 5 V / 500 mA.